Deneb Puchalski of Lie-Nielsen Toolworks demonstrating hand plane techniques. The gentleman in red and black checks is one of my blog readers. Hi, Albert! 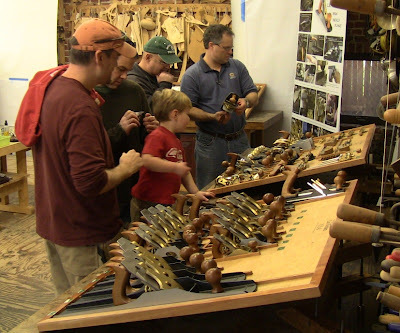 I got to participate in the Lie-Nielsen Hand Tool Event this past Friday and Saturday at Phil Lowe's Furniture Institute of Massachusetts, in Beverly, MA. This event had a number of connections for me. I had used Phil's articles and videos as my primary references to build my Queen Anne foot stool. The plan I had used was from the Society of Period Furniture Makers, who was to have someone there. I had met most of the other presenters at other LN events and SAPFM meetings, and met the remaining presenters online. I had emailed LN a month ago to inquire about participating to promote my blog and share the craft as a SAPFM member. Deneb Puchalski, LN show coordinator, responded to say that I was welcome to join them, and I should coordinate with Mickey Callahan, who would be demonstrating for SAPFM (and in fact it was Mickey's foot stool plan I had used). I contacted Mickey and we put together a tentative plan to share a bench. A big thank you to Deneb for allowing me to join in! 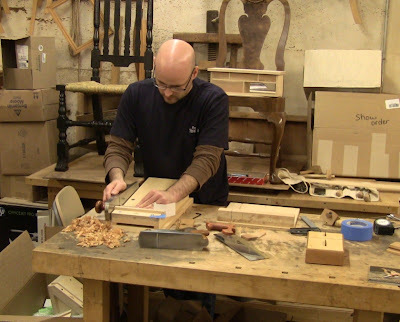 I brought my foot stool and enough tools and prepared stock to demonstrate making another set of cabriole legs. They make a good demonstration because the finished shape looks so complex, yet broken down into discrete steps, they can be done easily just with hand tools. When I arrived, Deneb told me Mickey was sick and unable to attend, so I took on the role of SAPFM representative. 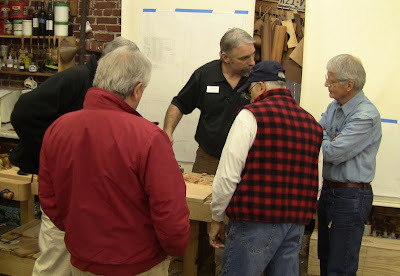 I was there all day Friday, and the afternoon Saturday (Saturday morning I attended Al Breed's second presentation to the Guild of NH Woodworkers on building a Townsend document chest; that'll be a separate blog post). A number of people were interested in SAPFM. The society is open to anyone interested in American period furniture, regardless of skill level. It's composed of a broad range of members nationwide, from hobbyists to professionals. Whether you work more with hand tools or power tools, if you read my blog, you would probably enjoy SAPFM membership, $45 annually. To me, the primary benefit is the opportunity to spend time with some of the top period makers in the country, online or in chapter and national meetings. They have an incredible wealth of knowledge and love to share it. 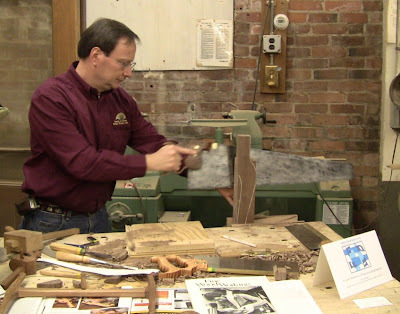 Many of today's well-known woodworking authors and instructors are members. My personal message to people (standing there flanked by two 14" bandsaws and a jointer that could serve as the flight deck of an aircraft carrier) was that I do everything with hand tools to show that even if you don't have access to power tools, you can still do fine work (and often, better work). Whether you're limited by space, funds, or concerns about noise, dust, or safety, hand tools allow you to do everything. After all, they got it done 200 years ago. Some steps may take a little longer and be a little more laborious, but they can all be done. You can build magnificent period-authentic furniture or other pieces in a tiny space carved out of even the most restricted living area. 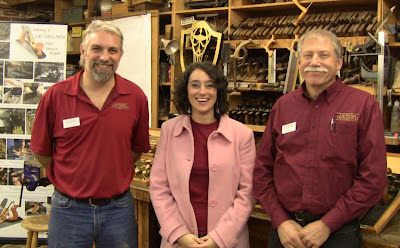 It was fun meeting several blog readers and members of my Google+ woodworkers circle, like Nick Roulleau of Mansfield Fine Furniture, and Lance Gomes, one of my students last year. It was great talking to you guys! I also handed out a stack of cards to interested people. So if you're a new reader, welcome! Phil is a great guy. 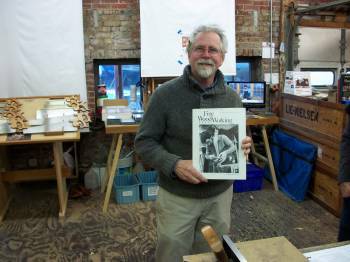 I've been reading his articles in Fine Woodworking books and magazines for years. He's one of the true masters of the craft. He taught at the North Bennet St. School for 10 years, serving as department head for the latter 5. He was the recipient of the 2005 Cartouche Award, SAPFM's highest honor. I was thrilled to be demonstrating under the eyes of the master. A bit intimidated as well, but he's nothing but encouraging! He offers a number of instructional programs at his Furniture Institute of Massachusetts, ranging from one-day seminars and part-time programs, to a full-time 2-year program. He also offers plans and videos. The LN team: Deneb, Marta, and Ted. If you haven't been to one of these events before, they're great fun. The entire LN tool line is available to try out, with knowledgeable show staff providing instruction and advice. You can put your hands on some of the finest tools on the planet, take a few shavings, chisel out some chips, make some sawdust. Get to feel them and how they handle on the wood. Like most hobbyists, I started out rehabbing flea market tools, but I've come to appreciate having at last a few premium tools to know what standard I'm striving for. These are investments that will still be working beautifully for your great-grandchildren. LN planes on display for people to try out. The three people in front are Mike Morton, a reader and Google+ acquaintance, Michael McCoy (just visible behind Mike Morton), and Mike Morton's son Liam. Mike Morton, of M. Scott Morton Furniture Design and Construction, lives just a couple miles from me, but we had to travel to Beverly to finally meet in person. You may have seen him (and Liam) in product videos from Highland Woodworking, a Lie-Nielsen tool dealer. Michael McCoy, of Castlewerks Fine Contemporary Furniture, also lives nearby; I used to work with him in his high-tech days. Peter Follansbee demonstrating 17th century carving on riven oak. He's working on a "joyned" chest. Peter is a joiner at Plimoth Plantation living history museum, and has been practicing green woodworking for many years. You can see him in action in the presentation he gave at the May SAPFM chapter meeting at Phil's. He sells carved pieces at his website, and has an excellent blog. He has a video available from LN, and an upcoming book from Lost Art Press, Make A Joined Stool From A Tree. 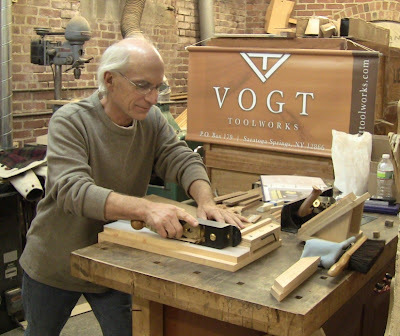 Tico Vogt, of Vogt Toolworks, demonstrating his Super Chute 2.0 shooting board, using an LN miter plane. The piece of wood he was shooting was about 4" long. He told me when he first started demonstrating his shooting boards a couple years ago, that same piece was 18" long. He's been shaving it down a thousandth at a time. Tico, a recent blog reader, sells his Super Chute 2.0 and Micro Sharp Honing Kit at Vogt Toolworks. Read his account of the event on his blog. If you haven't used a shooting board before, they are the secret precision weapon of hand tool woodworking. They allow for stock trimming to length and angle tolerances that would make NASA jealous. Matt Cianci (Matt the Sawright) sharpening a saw. 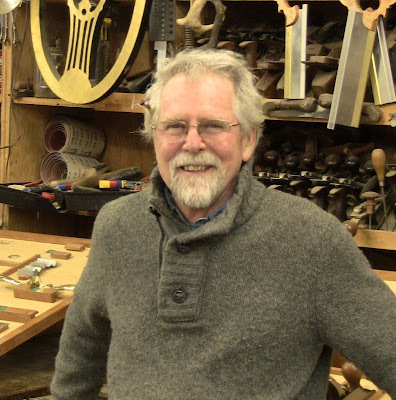 Watching him is Bill Barrett, who I know from Al Breed's Townsend chest project with the Guild of NH Woodworkers. 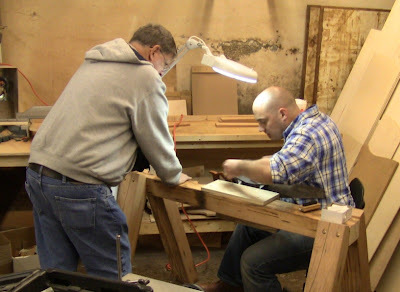 Matt C. offers saw sharpening and restored saws at The Saw Blog. Matt Bickford demonstrating his wooden molding planes. I first met Matt at an earlier LN Hand Tool Event. Matt B. has been making and selling wooden molding planes for several years at MS Bickford. They look gorgeous and work magnificently. The floor under his demo bench is always covered in beautiful long shavings. 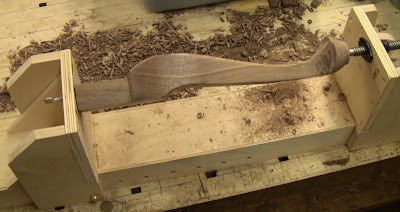 He also provides information on using molding planes on his blog, Musings From Big Pink. Matt Kenney, senior editor at Fine Woodworking magazine, putting a Vogt Toolworks shooting board set through its paces while constructing a small wall shelf with drawers. 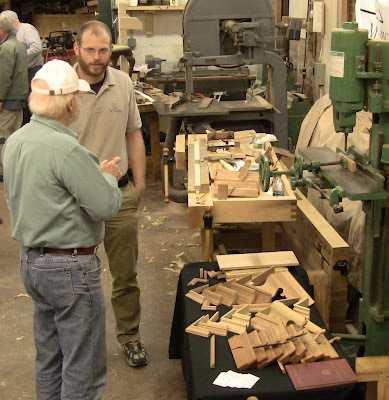 I had met Matt at last year's Hand Tool Event at FIM. The resources I used building my Queen Anne foot stool. Lower left, the plans from the SAPFM member website. 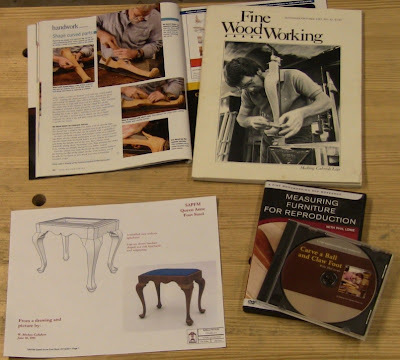 Lower right, Phil Lowe's DVDs on ball-and-claw foot and furniture reproduction. Upper left, Phil's article in the October, 2011 Fine Woodworking on chisel usage. Upper right, who is that fellow on the cover? Phil Lowe nearly 30 years ago, October 1983. Phil offers the two DVDs, originally released on VHS, for sale. The titles don't do them justice. He packs many additional details into each one. Phil Lowe, then and now. Photo by Tico Vogt. Tico was very excited when he saw my copy of the magazine. Be sure to read his blog post if you haven't already to understand how this connected the dots for him across nearly 30 years! Measuring Furniture For Reproduction should really be titled A Complete Mini-Course In Queen Anne Side Chair Reproduction, because he goes through the whole process of documenting a chair at the Peabody Essex Museum and then reproducing it in his shop. You can also get it as a package with the plans for the chair. I loved this DVD; I'll be getting the plans and building this chair as my next major furniture project. My workbench, with plans, magazines, and SAPFM newsletter for people to peruse. 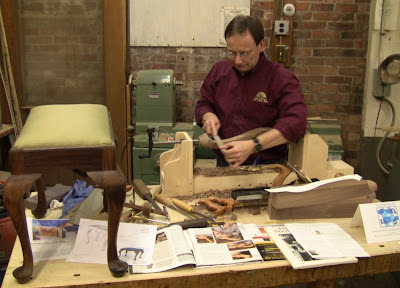 That's my finished foot stool on the left, and I'm demonstrating shaping a leg with a rasp on my Al Breed carving vise. You can see a couple of additional walnut leg blanks sitting under the cabriole pattern. Photo by Jeff Burks. 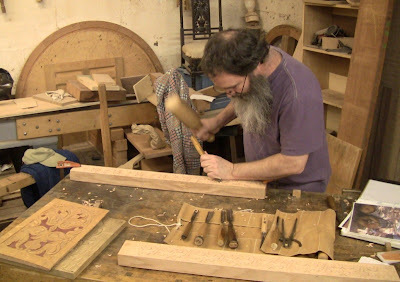 I demonstrated cutting and shaping a couple of cabriole legs with hand tools. I should have done the mortising first, but I wanted to have some curved parts for people to see, since the skills for working on them are less well known. I also brought some of the walnut stock cutoffs for people to try out the tools and techniques. I did all the curved work with my Gramercy Tools bow saw (available complete or as a hardware kit) and cabinetmaker's rasp, and my LN spokeshave. Gramercy Tools is the house brand for Joel Moskowitz's Tools For Working Wood, which will be at the January 6-7 LN Hand Tool Event in Brooklyn, NY. In the midst of talking to people as I worked, I even stumbled on another method for sawing out cabriole legs. I had cut out the original foot stool legs entirely with the bow saw. It works great, but even the coarsest blade is a pretty fine tooth, and my control is still pretty poor. So it takes a while, and I have to stay well away from the line, leaving a lot of cleanup work. Cleanup on the flat or convex portion of the curves is fast with a spokeshave, so that's not a problem...wait a second...flat portion of the curve? Aha! I realized that a large portion of the S-shape cyma curve is actually almost flat. That means I can use a full-size ripsaw on the tangent to the convex curve, down the length of the flat until it starts into the concave recurve. That's something like 75% of the length, even more for longer legs. I can rip to a close tolerance at good speed. So I tried it on the first leg, and it worked great! Sawing out a second leg, using a full-size ripsaw on the roughly straight portion of the cyma S-curve. Photo by Peter Follansbee. I'll be sure to use this method in the future, saving the bow saw for the truly tight areas. This falls under the category of "use the tool with the biggest bite you can". Added to the use of a carving or paring gouge to remove sizable chips from concave areas, rough shaping a leg from the blank by hand starts to approach the time it would take with a bandsaw. Well, maybe only twice as long instead of four times as long. I did manage to get a fair amount of work done on a leg in between talking to people! This was all by hand, starting from a squared-up blank. The LN spokeshave and scraper leave a gorgeous sheen. Note the gouge marks I haven't yet cleaned up on the top of the foot. I had a great time at this event. Thank you again to Deneb Puchalski for the opportunity. He could have said no, but he didn't. I know for most of the participants this is working, but for me as a hobbyist it's like a great party (I told Phil I would probably starve if I was doing this for a living, and he said that's why we have a trim figure!). It's great fun to share the knowledge. Looks like you had a great time. Thanks for recapping and posting it here. Also, thanks for mentioning the January Lie-Nelson event in Brooklyn. Looks like I'll have to hike it out there. I was at the event Saturday morning, I am so sorry not to have had the opportunity to meet you and see your work. It was a great event, as you said. It was my first, actually, and I was very excited to be there and meet some of the great folks whom I had only seen online and on magazines. Phil and Deneb took the time to talk with me, something that made me feel quite honored. Being surrounded by all that LN goodness was astounding! I wonder if I might contact you again, I live in Exeter, NH, and am interested in joining with other woodworkers to learn and for the camraderie. Thanks, guys! Dyfhid, sorry I missed you. Another active organization I'd recommend is Guild of NH Woodworkers, many of whom are also SAPFM members. They also range from hobbyists to professionals. And feel free to email me, I always enjoy talking about woodworking! Great write-up, sounds like you had a good time. Both Matt Cianci and Matt Bickford are teaching a class at my local school, CT Valley School of Woodworking. They also have LN hand tool events there fairly often, you should demo there as well. It might be a little farther afield for you than Beverly.